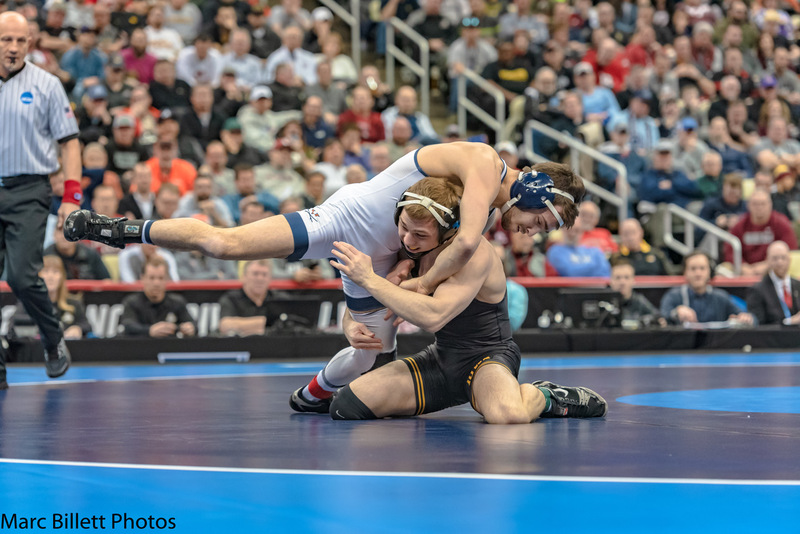 PITTSBURGH, Pa.: Spencer Lee was down to his last question in the post-match press conference, which was held in the bowels of the Pittsburgh’s PPG Paints Arena. Then came an excited group of people through the door at the back of the room. They had the floor and the room. Lee chuckled and didn’t have answer. But, it didn’t take long for the Iowa sophomore to get up from the table and celebrate, as Stoll put Lee over his shoulder and carried him out of the room. These were the few people who believed in Lee all season. That seems odd to say for a wrestler who has two Junior World Championships and an NCAA title to his credit, but it’s true. Lee had his doubters after a pair of losses to Northwestern’s Sebastian Rivera and was pinned by Oklahoma State’s Nicholas Piccininni. But none of that mattered Saturday night, as Lee put an exclamation point on his second straight NCAA Division I Wrestling Championship triumph. “It’s not really … It doesn’t matter,” Lee said of the losses, the illness that kept him out of the room, and the adversity. “I don’t make excuses, I got beat. Everyone had losses. They beat me fair and square. It doesn’t matter if you’re hurt, injured, sick, who cares? Everyone is a believer now. Lee made sure of it against Mueller in a workmanlike and precise final march to the championship. Lee, who outscored his five opponents this week by a 55-7 margin, struck first with a takedown in the first minute to take a 2-0 to the second period. There, Lee took bottom, but he couldn’t shake free. Mueller, like Lee, is a tough rider. He showed that throughout the two-minute stanza and took control of riding time. But, Lee was able to force a stall call with :02 on the clock to increase his advantage. Trailing 3-0, Mueller went neutral to start the third. He couldn’t get inside on Lee and gave up a takedown with 14 seconds left, giving Lee the 5-0 decision. “I just got to believe in myself,” Lee said. “And my teammates, they instilled a lot of power into me, mental power, because they tell me every day that I’m the best wrestler in the world. “You’ve got to believe that. I truly believe that you have to believe that, and they tell me that. Sometimes, I may not believe it while we’re in tough practices, but they keep me uplifted, and I think that was the difference this weekend … Just those guys, they kept on me. It didn’t take long for someone to bring up the thought of Lee, eventually, joining the elite club of four-time national champions. Lee wanted none of it and didn’t take the bait. He just silenced the critics and earned No. 2, and he did it in front of his hometown fans.